Air Canada was today named Best Airline in North America by the 2017 Skytrax World Airline Awards at the International Paris Air Show. It is the sixth time in eight years Canada’s flag carrier has been named the continent’s best airline by Skytrax, whose survey of almost 20 million air travellers is recognized as the global benchmark of industry excellence. “We are delighted to be recognized as the Best Airline in North America by Skytrax based on the opinions of those who know us best: our customers. 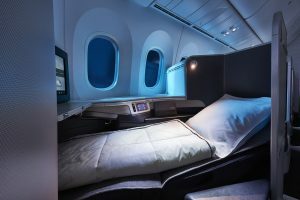 This award is a significant milestone in the transformation of Air Canada into one of the world’s leading carriers and is all the more meaningful given the increased competition in our industry,” said Calin Rovinescu, President and Chief Executive of Air Canada. “I thank our employees for their hard work and dedication in helping us earn this distinction and I thank our customers for their loyalty and support as we have expanded our reach across the globe. As we celebrate our 80th year in 2017, we are extremely proud to be Canada’s flag carrier, North America’s Best Airline and its only Four Star network carrier,” added Mr. Rovinescu. Enhanced onboard amenities such as signature dishes prepared by celebrated Canadian chef David Hawksworth coupled with wine pairings by world-renowned sommelier Veronique Rivest, and in-flight Wi-fi connectivity fleet-wide in North America to complement Air Canada’s personal seatback In-Flight Entertainment System offering hundreds of hours of free digital audio-visual content.